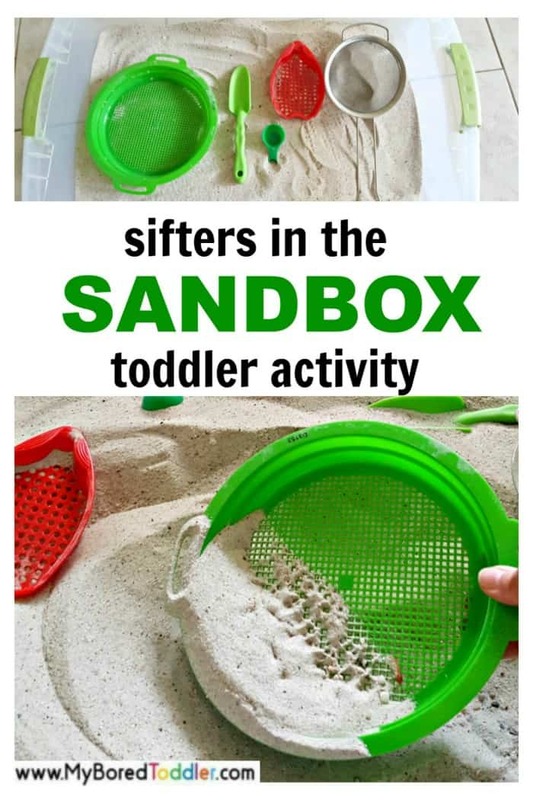 Adding sifters to the sandbox provides an exciting invitation for sensory play for toddlers. 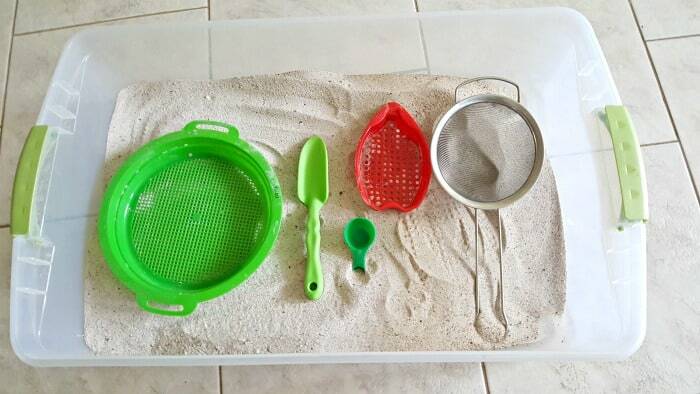 This simple sandbox activity is easy to set up and is a fun way to engage kids with hands-on exploration and discovery. The sandbox is a wonderful activity area for toddlers, offering lots of opportunity for child-led play. Indoors or outdoors, sand play is a valuable tool for engaging kids’ developmental skills, such as fine motor and cognitive skills. If you don’t have a big sandpit there are plenty of great sandboxes on the market. I really like this one or you can use a container like we have. 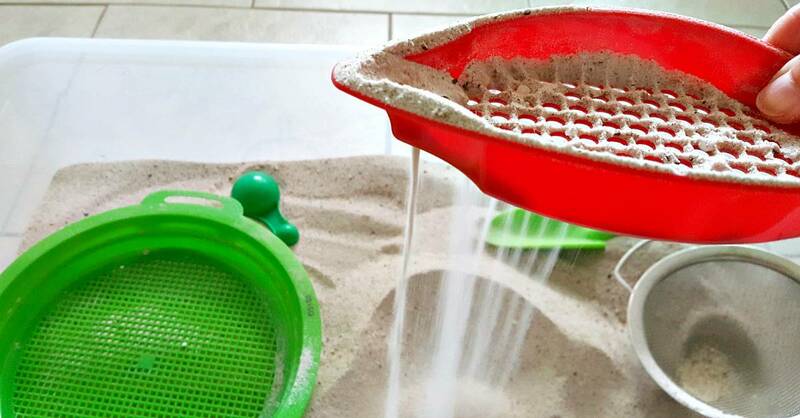 Preparing for sand play with sifters is simple, with just a few materials needed. Once the bin is prepared, it can be stored and reused over and over. Play sand (or real sand if you’re lucky enough to live near the beach!) . You can also get colored play sand if you want to get a bit fancy! Sifters. If you don’t already have any at home you can get beach play packs like these which are great value and will get used over and over again. 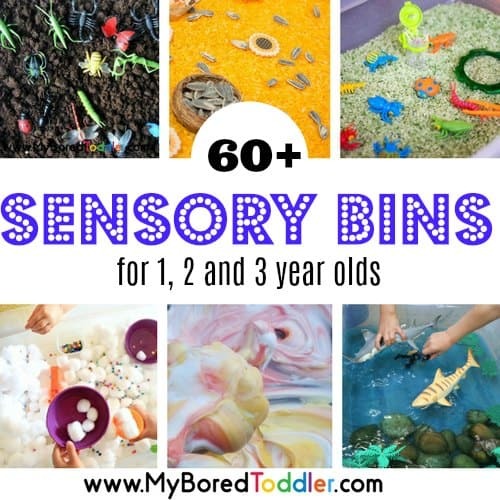 A plastic sensory bin with a lid is ideal for a sandbox activity and play sand can be purchased at a hardware store or online. Use strainers or sifters you have in the kitchen, or toys that can be purchased at a dollar store. A variety of colors and sizes will add interest to the play. Scoop up some sand with the strainer, or hold the strainer in one hand and add sand with a shovel in the other hand. 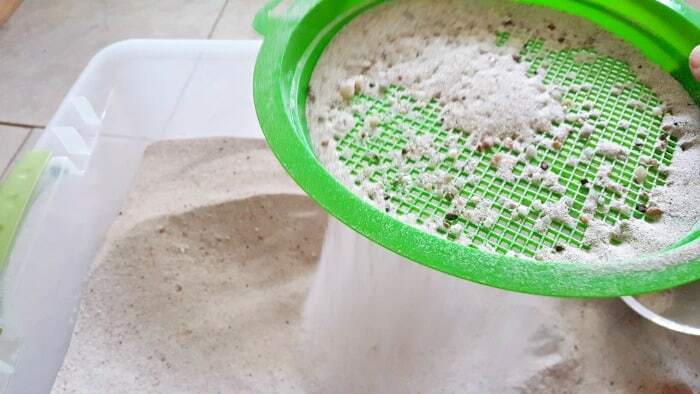 Watch the sand flow through the holes in the sifter; observe how the sand flows more quickly through some sifters than others; observe tiny pebbles left behind in the sifter. 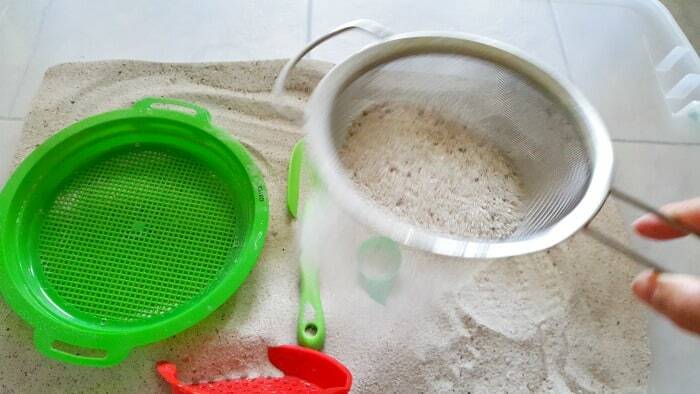 Bury a toy with the sand that flows through the sifter. Listen to the sound of the sand as it flows through a sifter. Kid will love the feel of the sand and its soothing properties. It can be cool to the touch, and easily scooped, stirred and poured. While the sand will flow freely through some sifters, a mesh strainer might need a few shakes to help the sand move along. 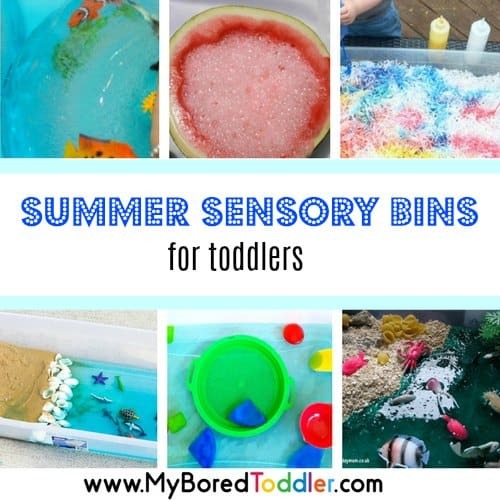 For toddlers who still put things in their mouths, a small sand table or sensory tub can easily be supervised to provide valuable sensory and fine motor play for kids. The sandbox is a stand-alone area that is fun for toddlers and preschoolers. While it can be a bit messy, there are some steps you can take to make it easy to set up and maintain. Inside, spread a tarp under the sandbox to make cleanup easier. The bin doesn’t have to be very big, just large enough to add a few toys or utensils. Outside, keep sand in an enclosed area that is easy to cover to keep animals and weather out of the sand. A small swimming pool is one solution for outside play. 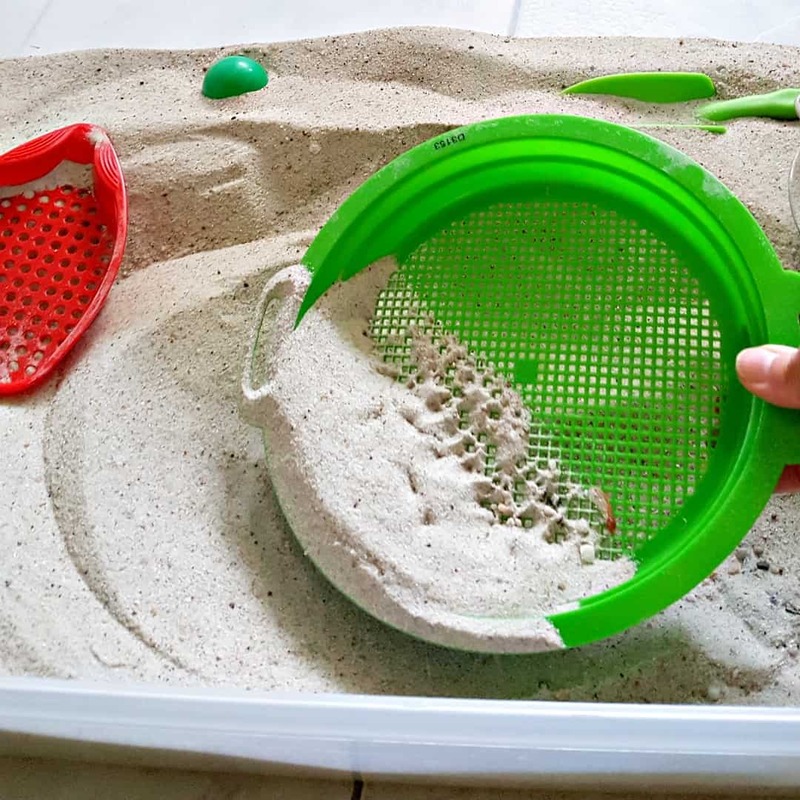 Keep sand play in mind as a quality quiet time activity that will provide lots of opportunity for learning through play for your busy toddler. I hope your toddlers will enjoy this sand play as much as we did. 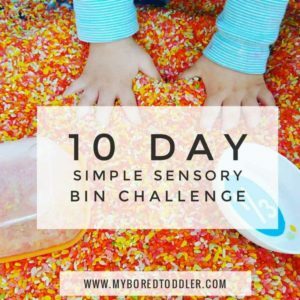 Make sure you share photos of your marshmallow sensory bin in our Facebook Group or over on Instagram – Use #MyBoredToddler so we can see! You can also sign up to our weekly newsletter or follow us on Facebook or Pinterest for more great toddler activities and ideas.